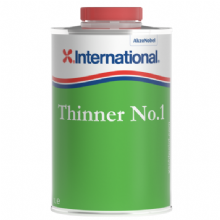 Thinner No.3 is suitable for thinning Antifoulings, Bottom Coatings and other Special Paints such as Micron® Extra, Micron CSC, Micron WQ, Cruiser® Premium, Cruiser Superior, Cruiser, Cruiser Future/Eco, Interspeed Extra Strong, Interspeed Ultra, Prima, Trilux, Soft Antifouling, Boatgard, Waterways, Fabi®, CT, Kobberstoff, Waterways Future/Fabi Eco, Veridian Tiecoat, Veridian Topcoat, Primocon®, Motorfarg and Interstrip AF. Suitable for equipment cleaning in association with all of the above products and also for Micron Optima, Micron Future/Eco and Lago Racing II. International Thinners No. 7 (1 litre). For Use With Epoxy Type Products. For use both above and below the waterline. International Thinners No. 9 (1 Litre). For Use With Two-Part Polyurethane Products. For use above the waterline.